It comes as no surprise to anyone - that there is a deep disconnect between sales and marketing efforts. There is little integration of input from sales into marketing campaigns - and as a result - there is minimal buy-in from the sales force to aggressively follow-up on marketing leads. Sales feels that marketing is out of touch with their customers, which in some cases is true. Sales feels that since they are closest to the customers, they have the best feel for their customer's needs. Marketing believes that their customer surveys and their research into industry and market trends, and their analysis of customer data, provides them with the information they need to best meet their customer needs. If the truth be told, this is the scenario that goes on in the majority of organizations and has gone on for far too long. 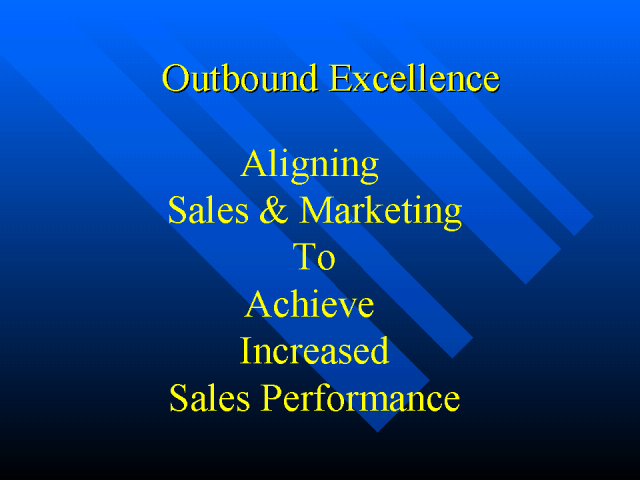 This webcast is designed to bridge that gap between sales and marketing and provide an integrated sales and marketing system that will maximize both sales and marketing efforts as well as result in increased sales and customer growth performance. If you're looking for increased sales performance, don't miss this webcast.